I designed this luscious pink tourmaline stack ring pictured with a AA grade faceted pink tourmaline gemstone and sterling silver heavy wire band. Band pictured in the main photo is solid sterling, 1.8 mm wide and great for daily wear. This is a top quality stone, not lab created or dyed. I show the band in both a smooth and hammered finish which gives it a slightly faceted texture. Custom band selections are available shown in the last 2 photos. 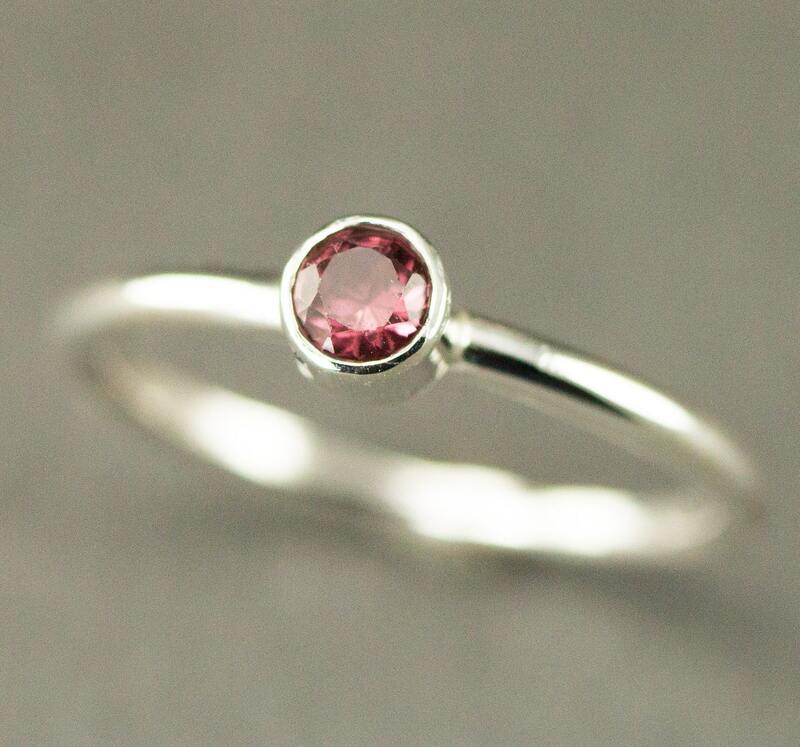 This is a fabulous alternative October birthstone ring. My standard ring is made stacking style with the tube setting on top of the band to allow rings to snug and stack together. If you prefer to wear your ring alone you can also select a low profile (low pro) setting in the drop down menu with the band soldered on the sides of the setting- style shown in the photo with a different stone. I am now offering AA grade 5mm and 6mm pink tourmalines. These are gorgeous stones and I welcome requests for alternative settings as a custom request. Ring is also available in 14k and 18k gold on request. ***To personalize your ring - Please write your band Style by letter A - G and Finish: Smooth or hammered for band A, shiny, brushed or oxidized or any combination like "hammered oxidized" in the personalization box or notes to seller at checkout if using a mobile device. I will contact you for any information not provided. Please note- no two stones are ever exactly alike when it comes to tourmaline colors. Although I try to get as many of the deep pink colored stones pictured, some will be just a little lighter in color or even peach-pink but all are equally beautiful. All silver used is 100% recycled and all gemstones are from suppliers that only buy ethically sourced stones. Your stacking ring is made just for you so please allow 3-5 days for me to make and send your ring. Please be sure to read my shop policies on re-sizing, returns and exchanges before purchase and ask any questions. If you are unsure of the size you need, and can't get to a jewelry store for a good sizing, I have a disposable ring sizer available in my shop for the cost of postage only.